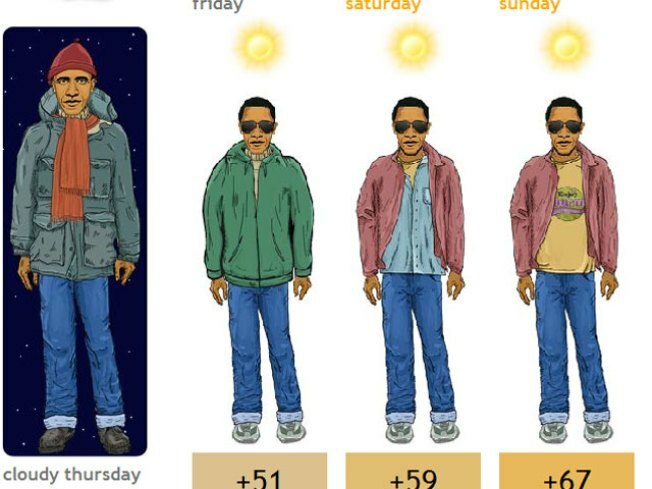 Want to know the forecast AND dress like Barack Obama? There's a site for that. Obama-Weather.com can give you a daily forecast for numerous cities around the world, just like a lot of other weather sites. But here's the catch: it can also show you how the president would dress for the conditions. OK, so this obviously isn't a game-changing Web site. But if you're looking to kill a few minutes of time today, it's worth a look. Try putting him in Alaska so you can see how he'd dress while looking at Russia from Sarah Palin's house. Or put him back home in Nairobi ... err, Honolulu. Good times! Oh, and while you're on the site, you can also see what the wardrobes of Angelina Jolie, House and Bender would look like on a crisp fall day. Cartoon Brangelina in Miami? That's hot.